As an important part of the world wide web, HTML is the earliest markup language available on the internet. It uses certain tags and element to markup the formats or even properties of text. Eventually, the browsers will render the text into different content of different styles. This is a heading line using with a <h1> tag. This is a link with a <a> tag. This is an aligned center image named logo.png with an <img> and a <center> tag. It’s obvious that HTML takes care of the format and style of the text. There are over 100 similar tags in the latest HTML5 standard. These, plus the properties for each tag, like the href is the property for the link, make it so hard to know the rules and use them well. Especially when you’re just a writer, not a writer/developer. This is why writers, who are not web developers themselves, started to find another way to write. In the mid 90s, wiki was designed to encourage people who didn’t know much about HTML to write. By introducing less tags that are more targeted for writing, the wiki engine transfers the content created in wiki into HTML in a structural way. By doing so, wiki users don’t need to learn a massive amount of HTML tags and properties before they can write on the internet. It’s obvious that the simplicity that wiki is after is more on the form of tags, but to some extent, it still is closely connected with HTML. In other words, when writing in wiki, you don’t really need to master so many tags, but less tags alone doesn’t make your work easy to read. Therefore, you will often find yourself distracted when reading your work in wiki. About a decade later, that is in 2004, Markdown was created by John Gruber. It’s a light, easy-to-read, easy-to-write plaint text format. By saying light, we mean that Markdown uses fewer, well-selected tags which basically won’t be a problem to master in an hour or two for most users. It also means that developers for Markdown editors need to deal with less tags, which makes it easier to develop and maintain. By saying easy-to-read, we mean that even though with Markdown tags added to the content, your work will still remain intact. That is to say, you can still easily read the content without getting disturbed by tags you use. Moreover, Markdown text can be easily exported to effective, well-structured HTML content. This is how you insert a hyperlink. Doesn’t it look like what’s in the plain text email? By now, you may wonder, how can I define the image as align center? The answer is, you can’t. This is where Markdown is different, or updated from, wiki and eve HTML: Markdown doesn’t care about the format of the text, i.e. how the text is displayed, it cares more about the property of the text, i.e. what the text is. But how will the heading eventually be displayed, what’s the font size, whether it’s bold or aligned center are not what Markdown care about. And these questions shouldn’t be what you, the writer, care about at this point. Only when you’re exporting or converting your work to HTML, will the Markdown engine tells that this is a heading, and the format will be left to CSS. By separating text content and styling, Markdown enables you to write without being confined to details such as text formats, while being light and easy-to-use. This is what makes Markdown popular on platforms such as GitHub and Reddit. By now, it seems that Markdown is the ultimate weapon for writers. But is it though? Can it meet all needs? Of course not. After all, nothing is perfect. As mentioned, easy-to-read is one of the many shinning points of Markdown, but it only works on text. However, images are indispensable when it comes to writing, especially writing for the internet. But you can’t tell whether you’re using the right image or not in this way. This could be the deal breaker for some. The Inspire Markup Language by Inspire turns the table. When you’re writing on Inspire, you can enter (img), and Inspire will prompt you to choose an image for your work, and insert it to your document in real time. Just as you can also see from the image above, the tags will be highlighted, making your work even easier to read. 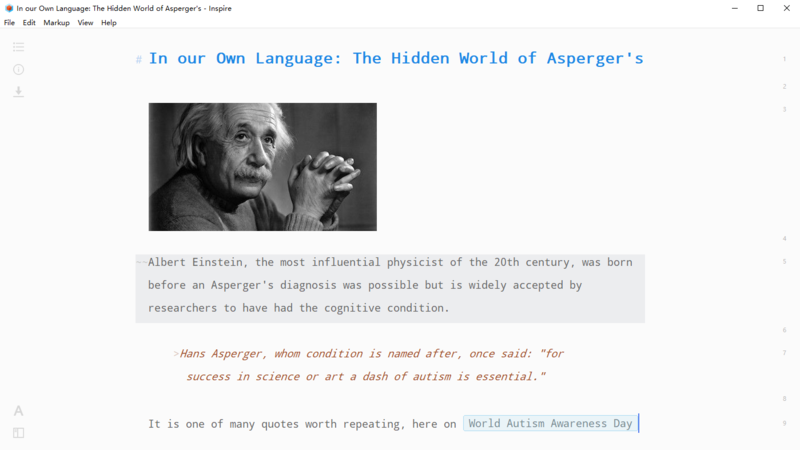 Maybe you will be interested in giving distraction-free writing a go? Previous postHow to Disable Gutenberg Editor in WordPress?